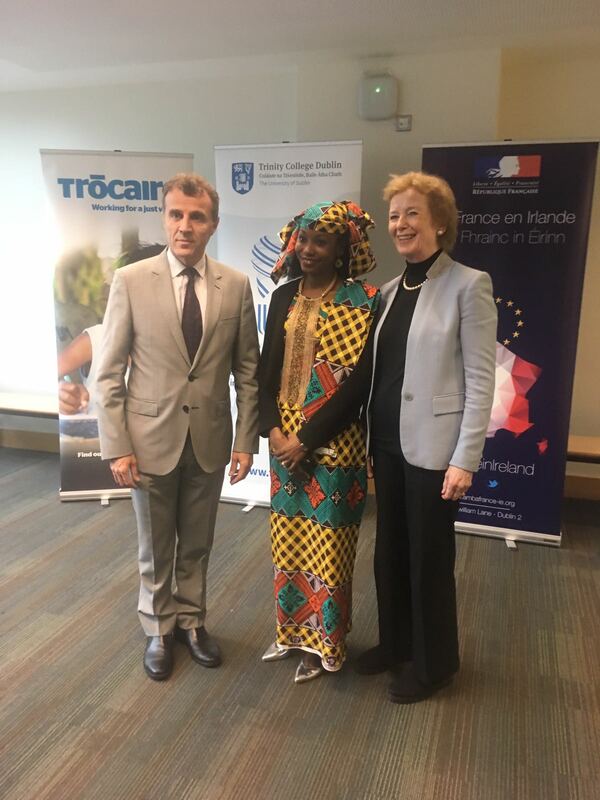 Mary Robinson with Ambassador Stephane Crouzat and Hindou Ibrahim during the Marketplace for Ideas event held in Trinity College Dublin. On Monday 5 November 2018, ‘Creative Responses to Climate Change: a Marketplace for Ideas’ provided a space for dialogue, information-sharing and creativity that brought together key figures involved in the climate negotiations, civil society representatives and activists, and interested citizens. To mark the second anniversary of the Paris Agreement entering into force on 4 November 2016, and in advance of COP24 to be held in Katowice, Poland, from 3 to 14 December 2018, the Embassy of France in Ireland, Trinity International Development Initiative, the Institute of International and European Affairs and Trócaire hosted a public event on the subject of climate change and its solutions. Mary Robinson delivered the keynote speech which focused on the need for a just transition, one which protects all people as the world embraces unprecedented levels of climate action. Speaking of the challenge as Ireland works to scale back peat extraction, she said “The need for an urgent end to peat extraction must not undermine the rights of the communities whose lives are dependent on the bogs. There needs to be a long-term strategy in place that ensures the rights and dignity of the people whose lives are impacted by this transition.” She spoke about how a diverse range of options must be explored to support workers and adopt a ‘leave no one behind’ approach, including investment in education and training, social protection and the creation of new jobs locally. In her speech, Hindou Omarou Ibrahim Coordinator of Chadian Indigenous Women and Peule People Association discussed the injustice of climate change. She spoke of how many communities across the developing world did not create climate change but are the first and hardest impacted by its consequences. In an impassioned speech, Hindou spoke about the challenges her people face saying “you can’t live without water, you can’t live without food, you can’t live without clean air”. These fundamental rights were under threat in communities around the world due to climate change said Hindou, who is a member of the executive committee of the Indigenous Peoples of Africa Coordinating Committee and a co-chair of the International Indigenous Peoples’ Forum on Climate Change. The ‘Marketplace of Creative Solutions’, a showcase of diverse and innovative ideas to respond to climate change formed the centrepiece of the event. Delegates were given the opportunity to browse creative projects and learn about new ways to understand and tackle climate change. 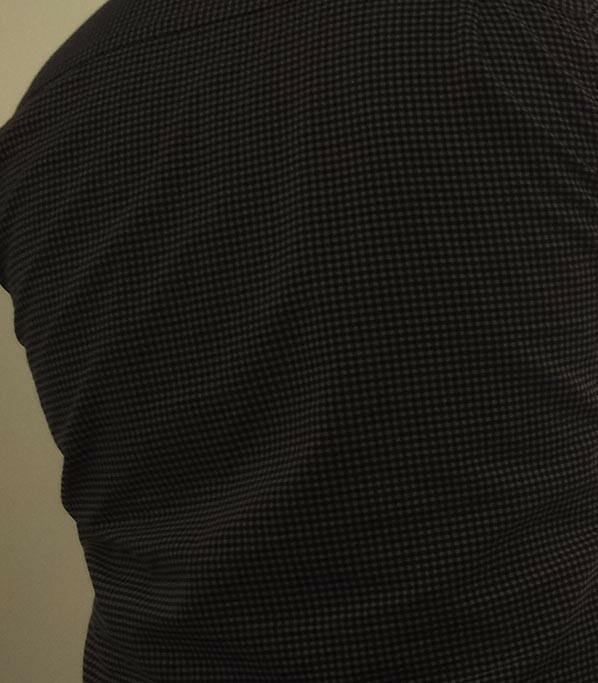 Many of the projects in the marketplace were brought forward by members of the public, following an open call that went out inviting applications earlier in the year.